The setting up of the Confucius Institute of Northern Ireland at the University of Ulster (CINIU) is a milestone in the relationship between both countries, according to a senior Chinese diplomat. The Chinese Consul General for Northern Ireland and Scotland Li Ruiyou told MLAs, members of the Chinese community, business people and academics at a dinner at Stormont to mark China National Day he was encouraged by the steady and vigorous development of collaboration and exchanges between Northern Ireland and China in business and education. "I'm very happy to know that the Confucius Institute at Ulster will soon be established," he said. "This is a milestone in education and cultural exchanges between China and Northern Ireland. "The establishment of the Confucius Institute at Ulster will not only expand the learning and teaching of Chinese language and culture but it will help the business people of Northern Ireland know more about China, so as to become better prepared and more competitive in China's market. "I'm sure many of these people will be envoys of friendship between Northern Ireland and China. Our cooperation will be anchored on a solid foundation. For this, we owe our gratitude to the University of Ulster for its untiring efforts and to the Northern Ireland Executive and the Assembly for their strong support." Earlier this month it was confirmed that Hanban, an offshoot of the Chinese Ministry of Education, had sanctioned the setting up of Northern Ireland's only Confucius Institute at the University of Ulster. With headquarters at the Coleraine campus and offices on its Belfast city centre campus, the Confucius Institute for Northern Ireland at the University of Ulster (CINIU) is a collaboration with Zhejiang University of Media and Communications in southeastern China. Like the 322 other Confucius Institutes operating in universities in 50 countries, CINIU will encourage private and public sector companies and organisations wishing to trade and engage with China to study not only the language but the business and administrative culture, its customs and practices to gain a competitive advantage. CINIU will promote the training of primary and secondary school teachers in teaching the Chinese language, history and culture to their pupils as well as facilitating artistic, cultural and academic exchanges between China and Northern Ireland. The chair of the Northern Ireland Assembly's Committee for the Office of the First Minister and Deputy First Minister, Tom Elliott MLA also welcomed the setting up of CINIU. "The committee hopes that this dinner will mark the beginning of a new era of closer ties between Northern Ireland and China and Members see the establishment of the Confucius Institute at the University of Ulster as an excellent example of that new era," Mr Elliott said. "We look forward to forging closer cultural and economic ties in the months and years ahead. "The work of the institutes is not confined to universities. They also promote an understanding of the Chinese language, culture and customs with events in schools, businesses and other organisations wishing to engage with China. "The institute at the University of Ulster will enable businesses to develop an understanding of Chinese business practices and culture through a series of tailor-made courses for their firms. An understanding of the Chinese way of doing business, of Chinese customs and practices and a working knowledge of the Chinese language will greatly assist businesses wishing to establish a foothold in Chinese markets." Professor PÃ³l Ã“ Dochartaigh, Dean of the Faculty of the Arts, welcomed the support CINIU had received in the political, business, cultural and educational communities in Northern Ireland and China. "This is a very exciting development not just for the University of Ulster or our partner university in Zhejiang but for Northern Ireland and for China," he said. "With China poised to take over as the world's largest economy, Northern Ireland cannot afford to focus solely on relationships with Boston and Berlin. It must also develop a relationship with Beijing. A working knowledge of China's languages, cultures, customs and practices will give people Northern Ireland a competitive advantage as it develops those relationships." CAPTION: Chairperson of the Northern Ireland Assembly Committee for the Office of the First Minister and deputy First Minister, Tom Elliott MLA, welcomes the Chinese Consul, Mr Li, to Parliament Buildings. The Committee hosted Mr Li to celebrate China Day, which falls on 1 October, as part of relationship building with China. 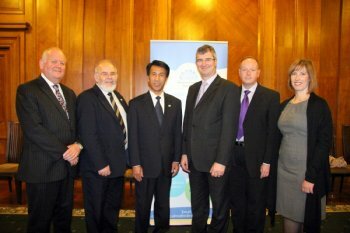 Pictured from left to right are: Jimmy Spratt MLA, Francie Molloy MLA, The Consul General Mr Li, Committee Chairperson Tom Elliott MLA, William Humphrey MLA and Sandra Overend MLA.